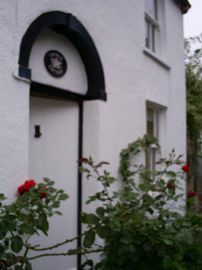 Church Cottage is a very pretty, detached one bedroom cottage situated on the slopes of the Mendip Hills in Somerset. 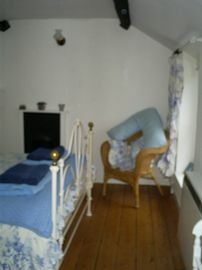 The cottage is cosy and well equipped - and ideal for a single person or couple who want to 'escape'! There is a wood burning fire in the sitting room and a bathroom en suite to the bedroom. Outside is a private patio, with table and chairs and barbecue. 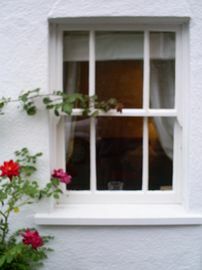 The cottage is ideal for anyone wanting to visit the nearby cities of Bristol Bath or Wells - or smaller towns such as Glastonbury, Cheddar, Weston Super Mare. 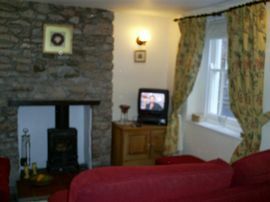 The cottage is available throughout the year for summer or winter holidays and short breaks. Bed is made up ready for arrival and towels and tea towels etc. are provided. Once in the vllage of Blagdon drive throught the High Street until you reach the Licve and Let Live pub. The turning oposit this is Church Street. Go down Church Street and just before you reach the Church you will see Church Cottage on your right hand side. 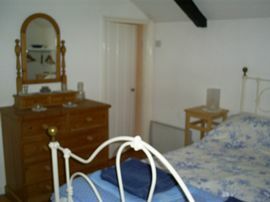 Short Breaks: From £125.00 to £200.00. Whole Weeks: From £140.00 to £340.00. 'Thank you for a lovely time in your cottage' Bron and Deb - June 2007. 'We had a lovely time in your cottage. Thank you very much' Mr and Mrs. Rowe - July 2007. 'Thanks, Sue. Its a lovely cottage' SimonAugust 2007.